Nemo and his friends are looking for a new home. The little magnetic fish prefer a metal surface to a reef or lagoon. 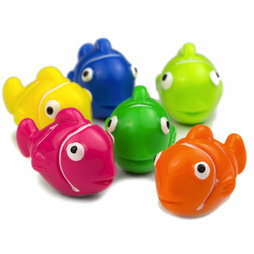 The colourful school of fish could soon populate your fridge or magnetic board and organize your chaos of notes. Disc-shaped super magnets are embedded in the acrylic figurines. Therefore, they are not just easy to hold on to but also pretty strong. The magnetic fish measure 25 x 15 x 19 mm. The themed packaging helps make the fish magnets a beautiful gift. They are delivered in a set of 6. The magnetic sea dwellers have the perfect shape and size. They are easy to grasp and don't cover up too much of the postcards and photos they hold on to. A fish magnet can hold 7 A4 sheets by itself.